Home › Active Components › Sensors › OSOYOO SmartHome .. This is an excellent collection of sensors and components to use with Arduino and Raspberry Pi. It was specially designed for smart home. 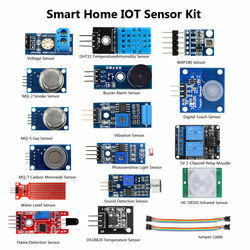 It comes with 16 sensor modules and female to female jumper wires, everything was properly identified and individually packed in plastic box.No matter where you are,the smart home sensor kit combined with arduino or Raspberry let you to control, monitor and secure your home.And you can visit here to know HOW TO DIY ,with this smart home system ,you will be able to control your remote relay in real time. --This kit combines the most common electronic components of smart home projects,developed specially for those beginners who are interested in Arduino and raspberry pi 3 DIY. --This has 16 sensors modules and delicately selected sensors to detect temperature, humidity, sound, light, infrared,smoke, motion, flame,vibration,digital touch, air pressure and many other commonly-used sensors modules. --This universal kit are compatible for Arduino UNO R3 / Mega2560 / Mega328 /Nano / Raspberry Pi 3, it could DIY 16 projects according to your need. --We eliminate many old-fashioned sensors which have low reliability and duplicate function as other sensor in the kit, the kookye modules sensor kits are choosed carefully for our user. --Our website (www.osoyoo.com) provide step-by-step instruction, detailed circuit connection graph/video, verified sample code and library package which can save lot of user's research time and speed up the learning progress. We accept Credit Card, Escow, Western Union, TT. You can choose a method which is the most convenient for you. Payment must be made within 7 days of order. If you can't check out immediately after auction close, please wait for a few minutes and retry. To protect your interests, your payment will be temporarily held by Aliexpress, and will not be released until you receive your order and are satisfied with it. If you purchase more items and need some discount of the shipping fee, please send the message to us, and we’ll respond you in 1 business day. Accept DROP SHIPPING. Please confirm the address. We only ship to cinfired order address, and your order address mus MATCH your shipping address. We highly value long term business relations. Buy with confidence! If you are satisfied with our items, please leave a positive feedback to us. We will leave a positive feedback to you later. Contact us by e-mail or our trade manager, before leaving any negative or neutral feedback or open any dispute. We'll deal with you to solve any problems as soon as possible.